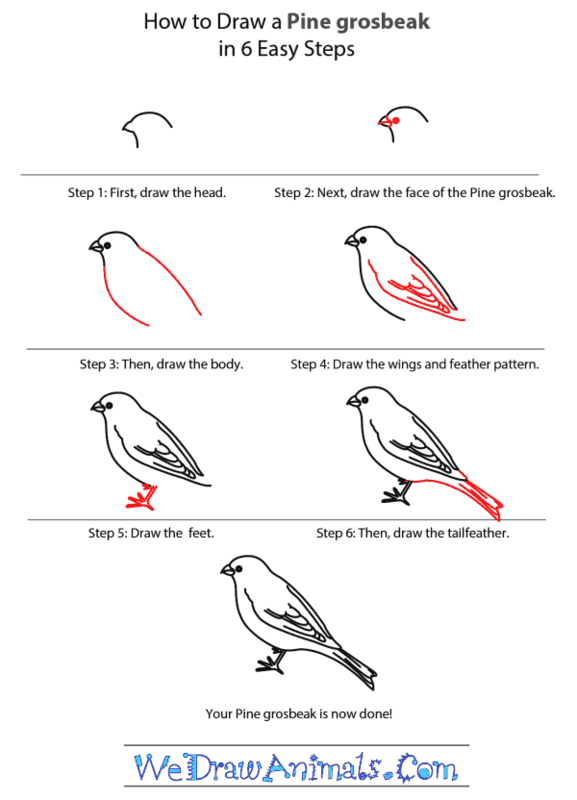 In this quick tutorial you'll learn how to draw a Pine Grosbeak in 6 easy steps - great for kids and novice artists. 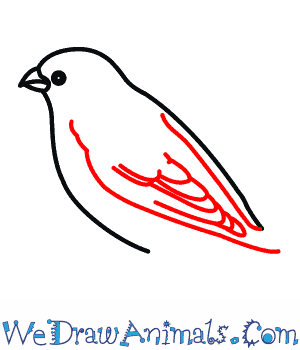 At the bottom you can read some interesting facts about the Pine Grosbeak. 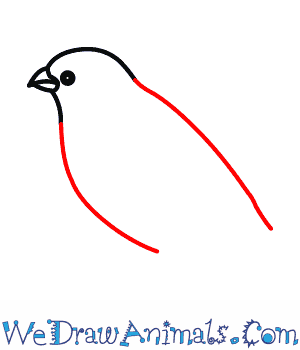 Step 1: The Pine grosbeak is a member of the finch family and we start drawing it by draw its head with a short, sharp beak. Step 2: Next, we draw the face by drawing a small circle for the eye and a small straight line for the beak. Step 3: Then we draw the body that is round but narrow. 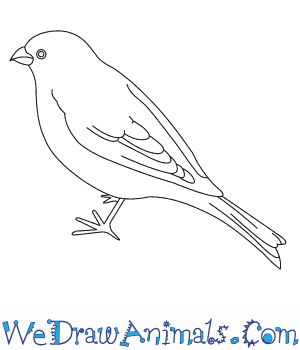 Step 4: The next step is to draw its wings and feathers. The wings lay across the pine grosbeak’s back. Step 5: Next, draw the feet. They have small feet with four toes with small claws. 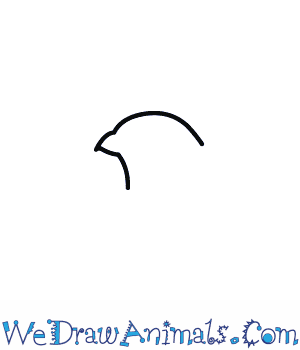 Step 6: The last step is to draw the tail with the feather detail. 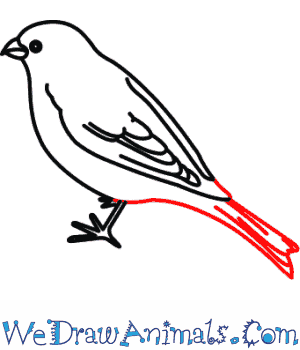 This bird has a forked tail meaning it looks like an arrowhead. One of the largest members of the ‘true’ finch family the Pine Grosbeak is found in forests across Northern Eurasia, and North America. It occasionally makes excursions into Southern Canada and the Northern United States. They are the largest and most colorful of the ‘winter finches’, males have pinkish red chests, heads, and backs with black tails and gray bottoms. Females on the other hand have yellowish heads and backs. Pine Grosbeak’s don’t migrate they stay in their northern habitats all year round. Grosbeak’s will forage in groups when their nesting season is over. Pine Grosbeak eggs incubate in only 13-14 days and young leave the nest in 2-3 weeks. Male Grosbeak’s will often feed females while they are incubating their eggs. Male Grosbeak’s continuously sing a warbling song to defend their nesting territory. Lesson plan note: Pine Grosbeak’s flock in colorful groups after their nesting season. Males and females both have a wide range of colors. 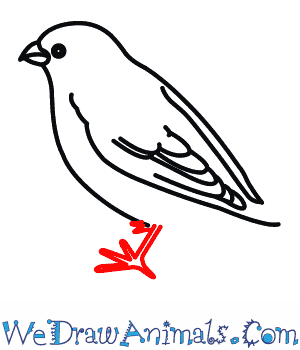 Give students blank cutouts of Pine Grosbeak’s and have them color their own version. Then staple all of them to the front of the classroom to create flock.